Successful pecan grafting and budding is dependent on proper collection and storage of propagation wood. Propagation wood must be collected during the dormant season and stored until the spring propagation period. Propagation wood should be collected after the trees have gone dormant. By mid-December, buds are sufficiently dormant and collection can begin. 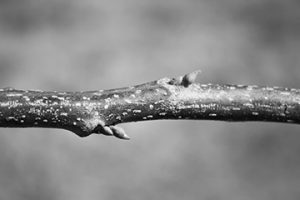 Collecting wood early in the dormant season lessens the chance of winter freeze injury, but graftwood can be collected any time before the buds begin to swell. Mid-December to early March is the time frame to gather graftwood for the spring grafting season. Vigorous one-year (current season) wood from the desired variety makes the best propagation wood for four-flap, bark, and splice and tongue grafting, as well as patch budding. Two-year old wood may be collected and used for propagation, but it is usually slow to start growing. Select healthy parent trees of a known variety. The larger wood, 3/8- to ¾-inch diameter is best for patch budding, while medium size scions, ¼- to ½-inch diameter, are preferred for grafting. 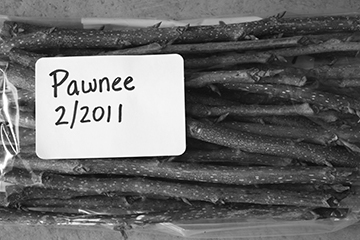 Collect varying sizes of wood to have a good selection to match the rootstock during grafting. This is especially important when using the four-flap grafting technique. The best wood is found on young, vigorous trees and in the tops of mature trees. Trees pruned heavily (dehorned) will force vigorous new growth satisfactory for propagation wood. Collect one variety at a time to eliminate mixing varieties. Label graftwood carefully to avoid errors in identification. Do not allow the wood to dry out before it is placed in storage. A small ice chest will help keep wood moist and out of the drying wind. Store the wood quickly to help eliminate drying problems. Figure 1. Optimum propagation wood for grafting is vigorous, 1/4 to 1/2 inches in diameter, healthy grayish green in color with plump, prominent, well‑developed buds. What may appear at first to be a single bud is actually a group of buds in vertical alignment. The smaller reserve buds will force into growth if the primary or secondary buds are damaged or lost. Handle propagation wood carefully to prevent damage to the buds. Remove the terminal end from the one-year-old wood. Make the cuts square. The best scions are usually taken from the center portion or basal two-thirds of each shoot. Propagation wood is normally cut into 6-, 12-, or 18-inch lengths and sorted according to large or small diameter size. Each 6-inch length will make a scion. Label the storage bag with variety and date of collection with a permanent marker. Mislabeled varieties will not become apparent for many years and can be a costly and long lasting mistake. Propagation wood must be kept alive and healthy during storage. Wood can be successfully stored in a durable polyethylene bag (one- or two-gallon zipper top bags work well). The wood is moist during collection and will not require additional moisture in the airtight bag. One of the most detrimental problems with storing graftwood is too much moisture and mold growth. If during storage, mold or too much moisture is apparent, open the bag for a few hours and allow the moisture to escape, before resealing. Store propagation wood where the temperature is 30 F to 38 F. An ordinary household refrigerator is a commonly used storage facility. Do not freeze the wood! When propagation season arrives, wood for grafting is taken directly from storage and used immediately. Keep the graftwood in a small ice chest during grafting and put back in storage when finished for the day. Only remove one variety at a time to reduce the chance of mixing varieties. For budding, the wood must be removed from storage prior to propagation and seasoned so that the bark will slip. This can be done by packing it in moist media such as sawdust and storing at room temperature or above (up to 80 F to 85 F) for four to seven days or until the bark slips readily. Always keep the wood moist. Use the budwood soon after it is seasoned. Buds from over seasoned wood usually give poor results. Never allow the wood to dry out from the time it is cut from the tree until it is used. Dry wood is the chief cause of propagation failure. Figure 2. Sealed polyethylene bags make excellent storage containers. Store at 30° to 38°F. Do not freeze the wood.